Before episode 18 of Gundam 00, I always find Louise Halevy and Saji Crossroad to be somehow insignificant characters who doesn’t contribute to the plot of the series. Well my opinion changed after watching last week’s episode. Before going further, a little introduction on the two characters. 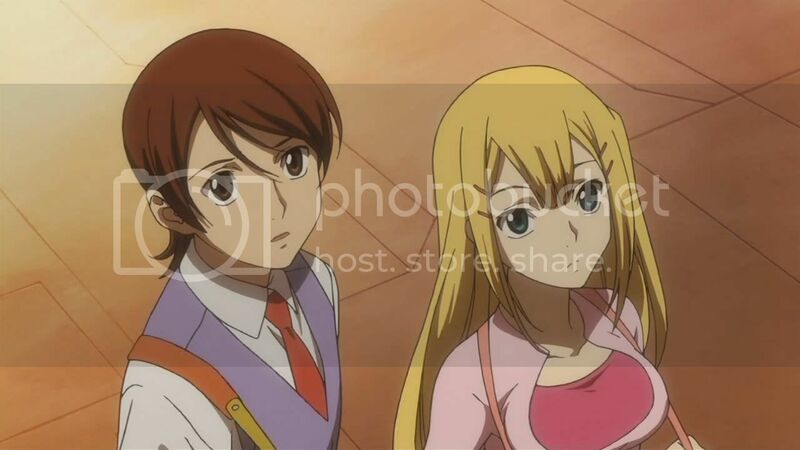 Louise is an exchange student from Spain and studies at the same high school as Saji, her boyfriend. Louise is bossy and always pushes Saji around. Saji on the other hand is gentle and often give in to his demanding girlfriend. He lives with his sister, Kinue who works for JNN and is neighbour to Setsuna, one of the protagonists of the series. So in this episode, Louise returned to Spain during the school holiday to attend her cousin’s wedding. During the ceremony, the Trinity siblings, a second group of Gundam Meisters, flew past with their Gundams. Nena Trinity seeing how the people below her are having fun while she is not, decided to fire her weapon at the people below. Louise survived the attack but lost her parents and relatives. Saji upon finding out that Louise is hospitalised, immediately flew to Spain and is relieved to find Louise to be alright. He then took out a gift and gave it to Louise. The gift turns out to be a pair of rings which Louise always wanted but Saji was unable to afford it. He told Louise how he got the money through doing odd jobs and asked her to accept it. As he was about to declare his love for her, Louise cut off his sentence and said although the ring is pretty, she is unable to wear it anymore. She then showed Saji her missing left hand which she lost in the attack. She apologised and broke into tears. Saji was devastated. A nurse stepped in and explained how she had lost all her loved ones during the assault. She then requested Saji not to upset her and to leave the room. Overwhelmed by the trauma, Saji collapsed on the hospital corridors as tears rolled down his eyes. An emotionally depressing chapter, one of the best episodes I have seen so far.